The 5th North-east India Karate Do Championship, got off to a colourful start at the Nyokum Lapang ground in Itanagar on Sunday. Barring Tripura, around 500 players from the other seven northeastern states, and teams from Arunachal Pradesh Police Sports Control Board, Assam Riffles and Darjeeling Gorkha Karate Association, will fight it out with each other for the top honours. 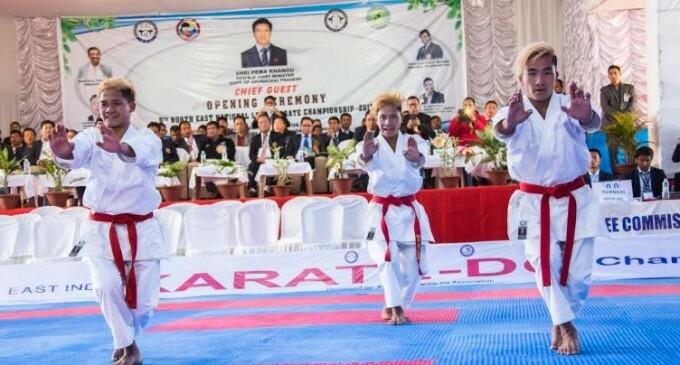 Arunachal Pradesh Chief Minister Pema Khandu, while declaring the championship open, lauded the unity and coordination among the state level karate associations of the region in projecting the North-east as a hub of promising and talented karate players. He said it was because of pioneers like Likha Tara, who heads the joint organization of all northeastern karate associations, the North East States Karate Federation of India (NESKFI) that karate has emerged as a sport and the states from the region excel in. “Our youths – particularly from Arunachal Pradesh – have carved a niche not only in the regional and national levels but also in international tournaments,” he said, and expressed gratitude to the state karate association for giving ample opportunities to players by not missing a single tournament of any level since its inception. Khandu informed the Central Government is giving special focus on developing sports infrastructure in the region. He said that the laying of the foundation stone for a National Sports University during Modi’s recent visit to Manipur was just an example. Admitting that sports in the State is suffering from lack of infrastructure, the Chief Minister assured to construct an Olympic Bhawan and a state-of-art multipurpose stadium in Itanagar. He urged the Sports department to identify a suitable site for it. “Union Youth Affairs & Sports Minister Col Rajyavardhan Singh Rathore has promised a multipurpose indoor stadium. Hence, we need to identify a suitable site for it, so that I can take up the matter with the Central Government,” he added. The Chief Minister also announced Rs 10 lakh as incentive to the organizers for holding the championship. Earlier, North East States Karate Federation of India (NESKFI) head, Likha Tara, highlighted the achievement of karate players of the region and Arunachal Pradesh.